Bradley's survives, still based at Feltham as at Feb 2016 but has to import all its eels - see note following. The Waggon and Horses also survives, having been rebuilt in the 1930s with fashionable mock beams. 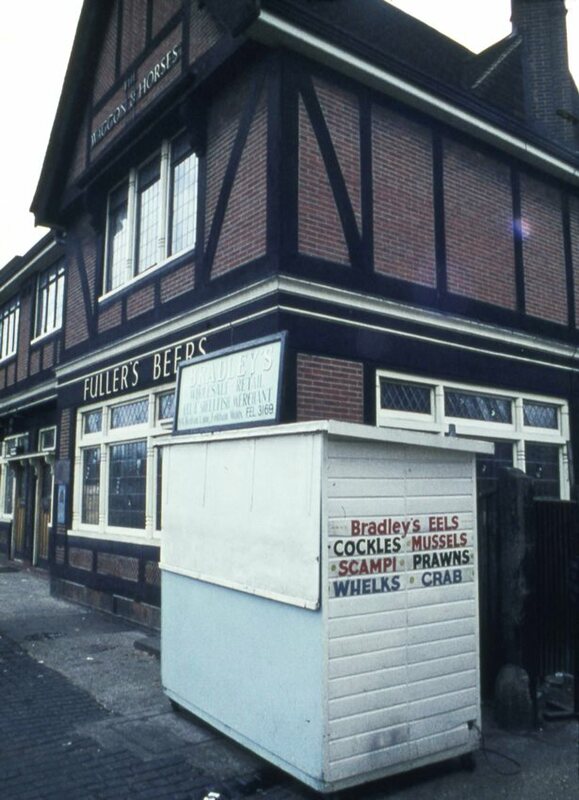 The original pub apparently dates back to at least the eighteenth century and was acquired by Fuller, Smith and Turner in 1882 (Brentford & Chiswick Pubs) pages 78, 79; they remained a Fuller's pub in 1972 . If you are interested in past landlords search the index of Beer Retailers and Licensed Victuallers for 'waggon': nine names recorded so far. As to the eels, eaten jellied - these used to be from the Thames but there was a dramatic decline in numbers in recent years. However googling on 'Brentford eels' brought up details of eel passes that will allow them to head upstream in the Brentford area (and presumably people will not catch and eat them).